The European Space Agency (ESA) at the Harwell Oxford Science, Innovation and Business Campus in Didcot, Oxfordshire, required a solution to ensure easy and safe access to the roof of the five-story office building and conference centre for maintenance and repair. The ESA building has been designed to be highly energy efficient and sustainable, reflecting the client’s wishes for low running costs and a BREEAM (Building Research Establishment Environmental Assessment Method) Excellent rating. Ground source heat pumps facilitate heating and cooling of the building and high quality insulation and natural ventilation of the office areas have all come together to keep energy use to a minimum. As well as providing a modern workspace for over 100 ESA staff the development is home to an indoor and outdoor exhibition area, a gym, a new vehicular access route and parking. 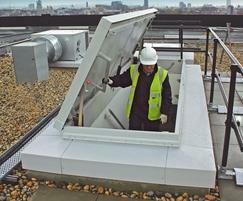 Two Bilco SS-50T roof hatches and two BL-ZBOX retractable ladders with trap doors were specified and installed. At 1220 x 1220mm the two Bilco SS-50T roof hatches are both large enough to move equipment to the roof for the maintenance of the green area. 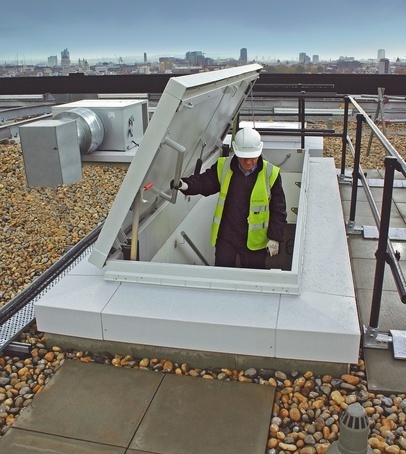 The SS-50T roof hatch includes specialist gasketing and increased insulation for superior energy efficiency and performance making it the perfect choice for a project where energy performance is key. The Bilco BL-ZBOX retractable ladder with trapdoor is manufactured to EN 14975 (DN 4570) standards and is designed for easy installation and use. Heavy duty counter balancing springs provide safe and controlled operation, whilst a timber lining and trapdoor discretely enclose the ladder from the underside so as to leave interior design uncompromised. Also available is a fire rated 1.5mm steel hatchbox with steel trapdoor, in F30 or F90 versions. The BL-ZBOX retractable ladder is available with telescopic handrails for safer use, insulation for thermal efficiency and can be fitted with electronic operation. Bilco offers a BL-ZBOX backboard designed to provide additional steps and 2 hand rails between the top of the retractable ladder and the top of the structural opening or roof hatch.